That’s right! Weather permitting, we’ll be opening up a beer garden next to our building for those of you who want to sit and drink outside. We’ll call it a “preview” of future attractions (i.e. a future patio space and the possibility of concerts and other special outdoor events down the road). We won’t have TVs in the beer garden, but we’ll be cranking the music up all your favorites will be on tap outside. It’ll be a fun start to the spring and a GREAT way to avoid the craziness and crowds downtown! Call us ahead at 316-721-5554 to find out what hours the beer garden will be open on the day you want to visit us or watch our social media for updates based on expected weather conditions that weekend. We’ll be getting in this special glass just in time for the mayhem of our weekend in the sun during this years NCAA men’s basketball tournament. But be FAST! We’ve only got 144 of these coming in and when they’re gone…. THEY’RE GONE! $9.99 each (includes 1 Featured House Beer pint of choice, excluding guest taps and Signature Series Beers. 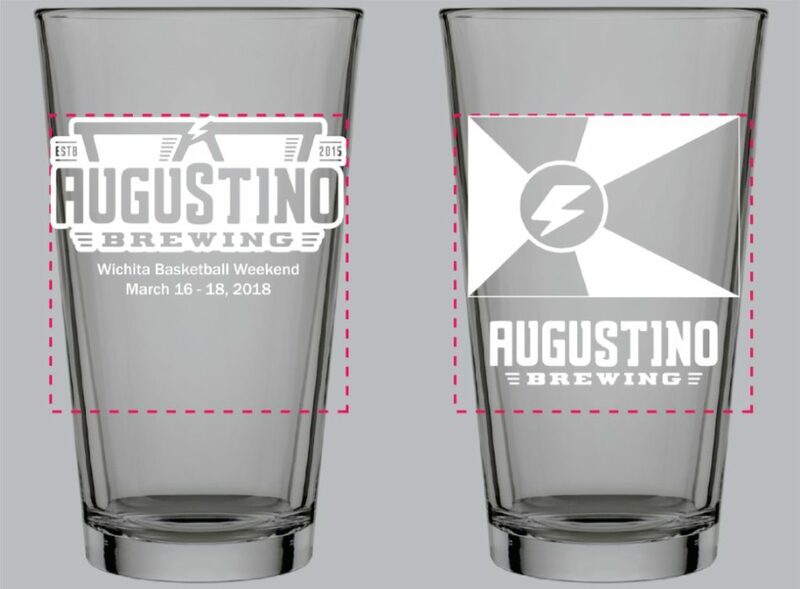 Don’t miss out on this collectible glass to mark the most exciting sports weekend the city of Wichita has ever seen! First Round: Each correct pick is worth 10 points. The seed of the winning team is added to the correct pick total. Second Round: Each correct pick is worth 20 points. Sweet 16 Â® : Each correct pick is worth 40 points. Elite 8 Â® : Each correct pick is worth 80 points. Final Four Â® : Each correct pick is worth 160 points. Championship: Each correct pick is worth 320 points. Augustino Brewing Company employees and family members are not eligible to enter. Each week of the tournament, there will be opportunities for bonus points. These will be announcedÂ both on social media and posted at Augustino Brewing. In addition, each day of the tournament (Starting 3/15-4/2/2018), you will earn 5 bonus points each day you check into Augustino Brewing on Facebook (1 check-inÂ per day). Opportunities for bonus points will be announced on Facebook, Instagram, and Twitter, and at Augustino Brewing. Winners will be announced on our social media platforms and at Augustino Brewing on April 3, 2018. We CAN ship prizes, but REALLY prefer you’d pick them up at Augustino Brewing. Here are the prizes we’re giving out! Overall Point Winner including all points collected during the brackets, daily social check-in bonus points AND weekly in-house contests. You sir, are THE Man or Woman and earn the respect of all. You win a $50 Augustino Brewing Gift Card AND an Augustino Brewing jacket AND an Augustino Brewing Stoneware Mug to take home and remind yourself of your awesomeness daily. Overall point winner from bracket points ONLY. Yes, yes. you win the bracket. Great job… but you didn’t engage in the extracurriculars like the guy/gal above. … or if you did, this award goes to the person who came in second overall in points… No double dipping on prizes you beautiful or handsome person you. This winner gets a $25 Augustino Brewing Gift Card AND an Augustino Brewing hat of choice AND an Augustino Brewing Signature Series glass to take home. You came in 2nd or 3rd overall. That’s okay. Every leader likes lots of followers. If you’re in 2nd or 3rd in OVERALL points (including points from daily social check-in bonus points AND weekly in-house contests), you still are a winner in our book and get to take home an Augustino Brewing hat of choice. So, you came in 4th or 5th Place in OVERALL points (including points from daily social check-in bonus points AND weekly in-house contests), but you coulda been a contender. But you weren’t. It wasn’t your fault though… It was the refs! And did you see that play? Anyway, all is not lost. You still get a premium quality Augustino Brewing pint glass for your efforts. Worst Scoring Bracket (does NOT include points from daily social check-in bonus points AND weekly in-house contests) – Wins an Empty Augustino Brewing Company Growler… and our sympathies.